The game started a fast pace with nothing to separate the two sides, but in the 5th minute referee Reid awarded the softest of penalties to Forfar. Top scorer BRYAN DUELL duly converted the spot kick. 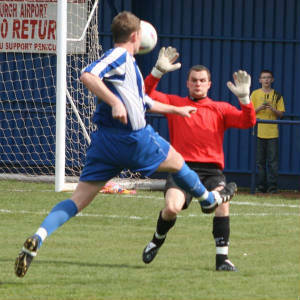 Ten minutes later as Penicuik attacked up the right wing, Sime managed to deflect a Gay cross over the bar. In the 20th minute, a long kick out by keeper Bald picked out Harvey. He turned quickly and fired off a twenty-five yard shot that dipped over the bar with Vanderdeyl beaten. In Penicuik’s next attack, Walker got the better of Gibb to send over a low cross that ran along the goal line, but nobody could get a toe to the ball and the danger was cleared. Immediately afterwards, Harvey turned his marker and lobbed the ball over Vanderdeyl only to see the ball bounce up, hit the crossbar and cleared. Then Steel on the left wing saw his low tempting cross desperately booted clear. 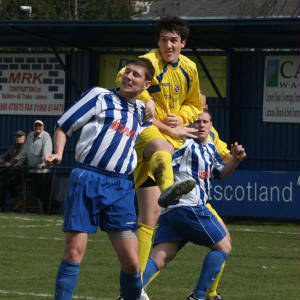 Penicuik were now in charge of the game and Gay on the right wing was causing the Forfar problems with some great penetrating crosses but the defence held firm Then in the 34th minute, Penicuik were denied a penalty when a cross was handled in the box, but referee Reid was unmoved. Minutes later, Steel came close as his attempt on goal went inches over the bar and that was followed up in their next attack by a Walker strike that wide of the target. In the opening minute of the second half, another great cross by Gay tested the Forfar defence, and again they were up to the task. Five minutes later, Vanderdeyl, under pressure, was forced to punch another Gay cross to safety. In the 55th minute, Penicuik attacked again when Barr drove into the penalty box and was clearly up ended, but again referee Reid ignored the penalty claims. Then, in the 63rd minute, against the run of play, Forfar broke quickly from midfield with Barr left lying injured after a hefty tackle. 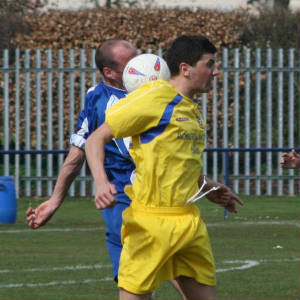 The through ball picked out GRANT LAWSON who slotted the ball past the advancing Bald. 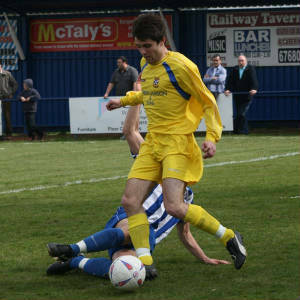 Penicuik refused to give up and continued to battle hard and in the 69th minute Meikle saw his header off a corner kick skim the crossbar. Three minutes later, following another corner to Penicuik, Meikle again rose above the defence, but this time his header went wide of the goal. In the 77th minute, a neat one two between Harvey and Walker saw Harvey’s shot comfortably save by the keeper. Shortly afterwards, a long ball found Harvey and his strike from just outside the left side of the box beat keeper Vanderdeyl hands down, but once again the woodwork came to Forfar’s rescue. 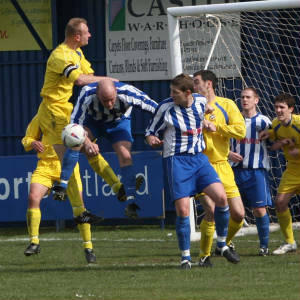 Right on full time, the Penicuik defence was caught out and Duell had only Bald to beat, but the keeper stood big to pull off an excellent save.